Ahh, Jacksonville Florida, a boater’s paradise. Nestled up against the Atlantic Ocean on Florida’s East coast and the St.Johns river if you own a boat, you’re living the life. This city has a lot to offer anyone who finds themselves inside the vast city limits. 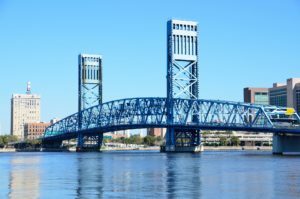 Jacksonville has lots of attractions, museums, and nightlife to entertain anyone of any age and any interest. Restaurants, beaches, nature preserves, and fishing this place has it all. Jacksonville’s weather is always nice since it’s has a subtropical climate, so you never have to worry about having to winterize your boat for the winter season. Another feature of Jacksonville is the Naval Air Station Jacksonville, and the Naval Mayport station where our loves members of the Navy train and prepaid for their military careers. The base employs over 23,000 military and civilians who work hard to make sure everything runs smoothly. We here at SellUsYourBoat.net salute our servicemen and women who are out their life on the line every day for our country. That’s why we here at SellUsYourBoat want to offer our services to service members and their families in any way we can. If you or an active duty service person need an extra bit of cash, we can help. We buy used and like new boats from people every day who may need a little extra cash or to get rid of an old boat they’re not using. We specialize in buying used speed boats, all-purpose fishing boats, center console boats, and walk around fishing boats. No matter what your selling, we’re interested in buying!! So if you need a fast and easy way to sell your used boat, we can help! We make sure selling your used boat is fast, easy, with our free quote system. Simply fill out our quote page here and we’ll give you a quote on your used boat. FREE! So why wait? Get your free quote today!